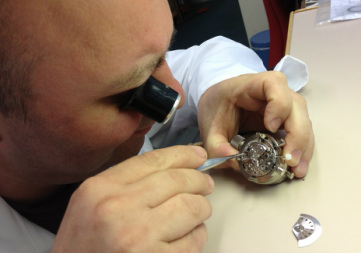 Our watchmakers is Rolex Accredited and our workshop is a Breitling Officially Certified Service Centre and OMEGA authorized service centre . This means that we need to service watches to their high standards. Even the tools must match their requirements of quality. The parts are supplied by the manufacturers of the watches. Complete strip down of the watch mechanism. Worn parts are replaced with brand new genuine parts. The case and bracelet are separately ultrasonically cleaned and refurbished if necessary. The movement is completely re-lubricated and regulated. A series of tests for timing. A full 12 month warranty is offered on all full service work. (24 months for Rolex and OMEGA watches).